In some cases they just called us losers. Me: "Dad, are you going to join us and do Fiftyfifty.me?!" Dad: "NO. Unlike you guys, I have a life!!!!!!" My fiftyfifty.me started like this - Jon Yang came up with this brilliant idea to read 50 books and watch 50 movies during the year. Inspired, I got the idea that not only would I want to join him (because it sounded like a massive nerdy undertaking, and therefore, just my sort of thing), but perhaps others would too. Looking at our site now, 355 people publicly signed on, with others doing it on the wings. And here we are, one by one, crossing the finish line. As you can imagine, my brain is a little bit fried (particularly as I lived the month of December in a state of college finals-style panic). But here's the list! ** denotes favorites. 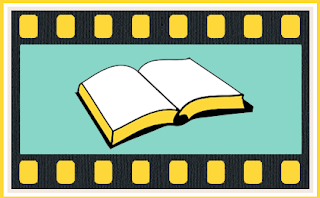 In what is no surprise to anyone who knows me, it was harder for me to get around to the movies than the books. People ask if we cheat and read children's picture books, etc. to get the count up. No, although I did foray into Young Adult books on a few occasions (The Fault in Our Stars, by John Green, is one of the best books I've read in recent years, actually). And I definitely generally found myself more willing to throw a book aside (or turn off a movie) if it wasn't doing the trick. Getting stuck and bored is one of the reasons people turn away from reading, I think, so I managed to avoid that almost completely. In general I was so eager to hit the numbers that I gobbled up whatever came my way, which made it a much more interesting year of reading, taking in recommendations from other people at a pace I've never done before. In the end, it's a complete mash of topics and quality, but it was also, without a doubt, fun as hell. I am most definitely signing on to do this for 2013. Starting tomorrow, in fact. No rest for the wicked, I say. I can list on one hand the number of books that have left me breathless and in tears. 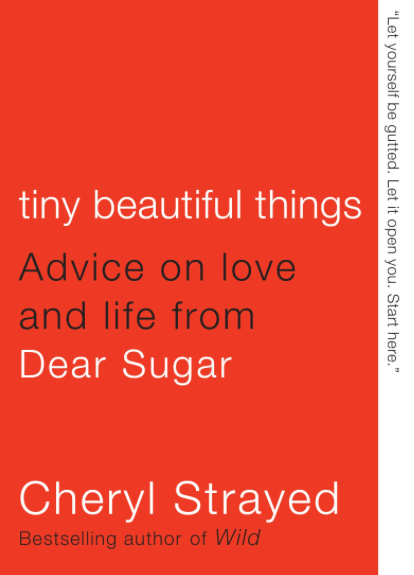 The most recent is Cheryl Strayed's Tiny Beautiful Things, a compilation from her Dear Sugar column. I had seen the book around, but didn't think much of it. From the cover I thought it might be a shallow dating column from some women's magazine that was already full of enough junk advice that I didn't need more. How mistaken I was. I opened Tiny Beautiful Things a couple of days ago and entered a world in which people write in to confess and and try to make sense of their sins, or their deepest fears and insecurities, or their latest personal tragedy, with a complete stranger who responds each and every time with a logic, compassion, and a tapestry of words so beautiful that I found myself literally breathless. Although she could have just doled out some smartly-written advice, the brilliance in the column is in how far she goes into the trenches with her readers. She scrapes up the very personal memories and stories, the lessons and experiences we, as strangers, have absolutely no right to access, and lays them before us, like a most patient teacher, so that we may learn something. She doesn't flinch as she offers up her scars, so we can run a finger along them, perhaps even recoil, before looking again. Closely. While I have been reading Tiny Beautiful Things I have been consumed by the themes, the plot lines of the letters, and the stories Strayed used to convey her ultimate advice. Consumed, I tell you. I hadn't even finished the book before I'd bought a few copies to fire off to friends, and as I read I kept a mental tally of the others who will find it under their Christmas trees, in their birthday gifts, slipped to them in a moment when they need it most. I realize I'm being vague here, and it's a conscious effort not to spoil the reading experience that I hope you will have after reading this. I understood why certain topics hit home with me, but what of the others? How was I so affected by stories of marital infidelity, of grief after the loss of a child, of dealing with middle-aged body image issues, situations that couldn't be further from my realities? This, my friends, is the key to good writing. We often talk about fiction being transcendent, but I don't think we talk enough about nonfiction and its ability to bring us into other people's stories and lives and make us feel their pain for the moments we share. Dear Sugar's advice is directed at the person who has written in, but in the same way that a parent will say something to a spouse fully knowing the child is listening in. It is written to them, but entirely for our benefit. Under the layers of jealousy or greed or regret or guilt or anger, or the hundred other emotions swept onto these pages is an underlying theme that we choose how we live. We do not choose our circumstances or the hand we're dealt - and as you read letter pile up on letter, you realize that, no matter how wildly different our lives come out, everyone has problems, everyone has difficult choices to make. Although the details of our individual lives couldn't be more different, the themes are shockingly similar. I'm convinced that each reader will take something different away from this book. Me? This: We do not choose some of the detours or roadblocks or forks in the road, but we choose how we proceed. We choose how much compassion and patience we bring to the most difficult circumstances. It isn't meant to be easy, but it can be done. 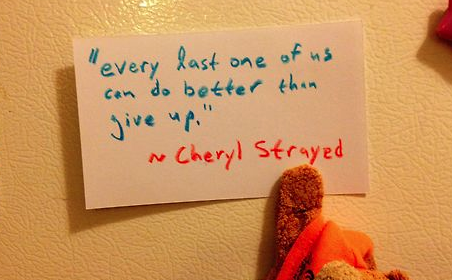 Most importantly, we choose how we work forgiveness - of others and of ourselves - into the narrative of our lives. This book may, like me, make you tear up in public - repeatedly. But it will be worth every tightening of the chest, every locked-away story or memory that comes up to visit you. Promise.